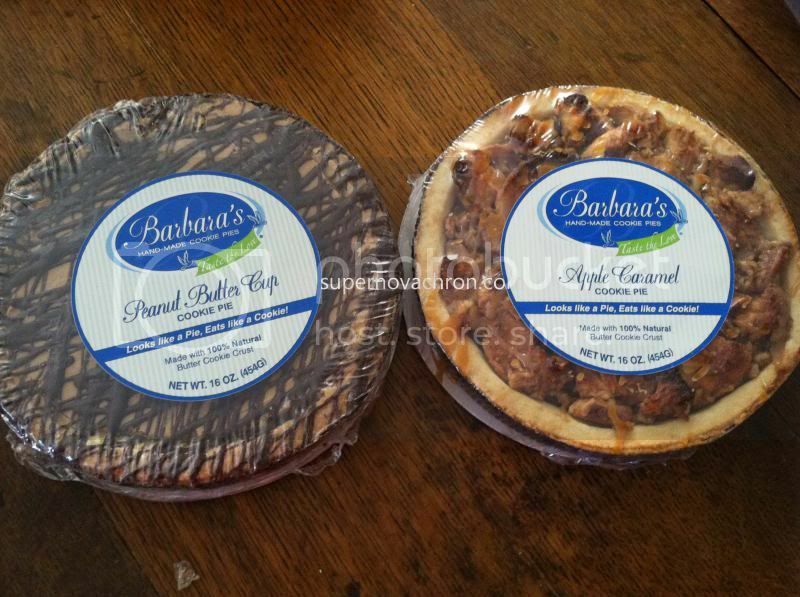 I was a very pleased to know that I have been contacted by one of Barbara’s Cookie Pie representatives to work on another product review. For those who haven’t known about the website, there specialty is a very scrumptious dessert of cookie pies and gourmet butter cookies. A week ago, I have received the Apple Caramel Cookie pie and Peanut Butter Cup cookie pie. Oh, when I first looked at it, they look really good, which a perfect timing as we run out of dessert by the time I received the products in the mail. My first impression with the desserts is indeed very true. I was drooling with the Apple Caramel Cookie pie and so it is the first dessert I opened and tried. I was blown away when I tried the Apple caramel cookie pie, the flavor is very good, and the apple caramel filling is so excellent that I ate at least 2 slices. The cookie pie is also good; you will enjoy the zest of a good filling and cookie in one dessert. You will like the flavor or apple caramel filling as well as the taste of cookie make as the pie. Product Description: Scrumptious Apple Caramel Cookie Pie started out as an autumn seasonal variety but was so popular we decided to make it available all year long. This baked beauty brings you the comfort and aroma of home with the aroma of cinnamon-seasoned apples, brown sugar, pecans and caramel atop a home-spun buttery cookie crust. A class act just like our own Sibylle. I also got the Peanut Butter Cup flavor, which is my two boy’s favorite. After they’ve seen that the cookie pie comes with a peanut butter cup flavor they feast the pie until it is all gone. It seems to be very good as both enjoyed the very scrumptious cookie pie. My overall familiarity with Barbara’s Cookie Pie is wonderful. I love the cookie pies, I received from them; they have loads of flavors online. To see them please visit the website @ http://www.barbarascookiepies.com. You can also call @ 1-855-SENDPIE to order. Don’t worry, it is not just cookie pies they’ve got; they would treat their customers like family so they also have gourmet butter cookies. A disclaimer: This is NOT a sponsored post. I received the Apple Caramel cookie pie and Peanut Butter Cup cookie pie products for free in exchange of my honesty review. The outlook I expressed is 100% exclusively mine. Goodness! That Apple Caramel Cookie Pie sounds heavenly!!! Wish there are pastry shops that serve that kind of pie here in the Philippines. i love sweets and desserts, both sounds so delicious and yummy! They look so yummy that I wanna grab them in front of the monitor! Hehe! yuuuuum, can I have a bite or two? or maybe send me 1 whole box. haha! i have a family of cookie lovers! hmmmmm oh am geee...now I have to eat something sweet! these sound oh so delicious!!!! I can never say no to a good looking apple pie!!! Yum! Apple pie it is! I love apples and cinnamon! Two of the best flavors on earth! You got me drooling at your post! Thank you for sharing. The description of the pies made my mouth water! LOL! Both products are yummy! What a luck blogger you are sis! My sweet tooth boys at home would love these. Very sweet for a dessert but it's good and tasty. I like pies! I am not familiar with this brand, but I would love to try it.